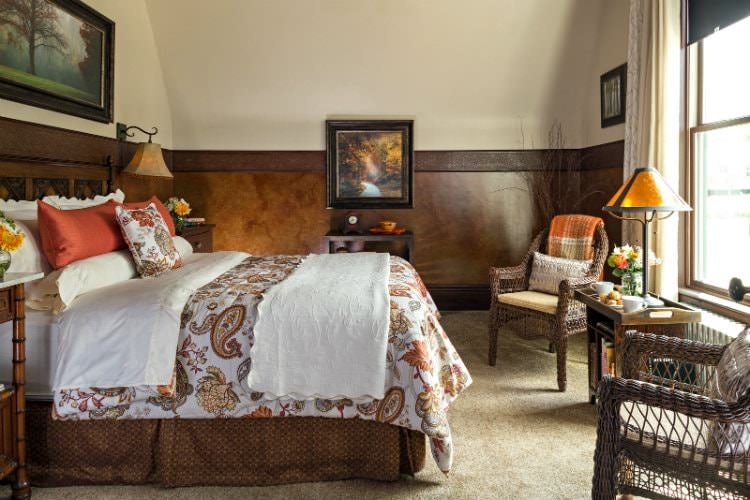 When considering lodging near Falling Water and Nemacolin Woodlands Resort in the Laurel Highlands, you will not regret putting Hartzell House Bed & Breakfast at the top of your list of places to stay. Owners and innkeepers, Kitty and David love to travel, so they decided early on to create an environment where guests would find most everything they need easily at hand. The two try to mindfully choose all products used at the B&B with the idea of benefiting not only guests, but our planet, and the local, national, and global community as well. In that spirit, all baths are outfitted with healthy and organic bath and body products; from Alpha-Zelle foaming hand wash (a small, woman-owned business in New Jersey) to Nutribiotics hair products, and everything in between, you can look great and feel good about what goes on your body. 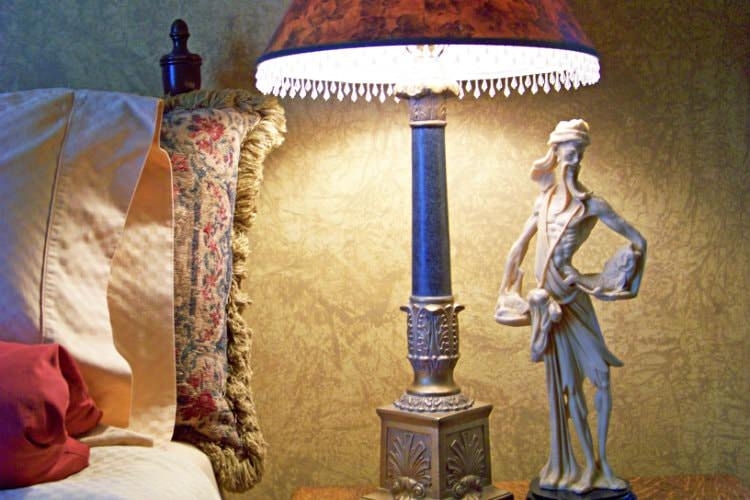 All Hartzell House Bed & Breakfast Guest Rooms and Suites are outfitted with high-quality beds, bedding, and bath linens, comfy robes, snacks, and either purified water or sparkling water. 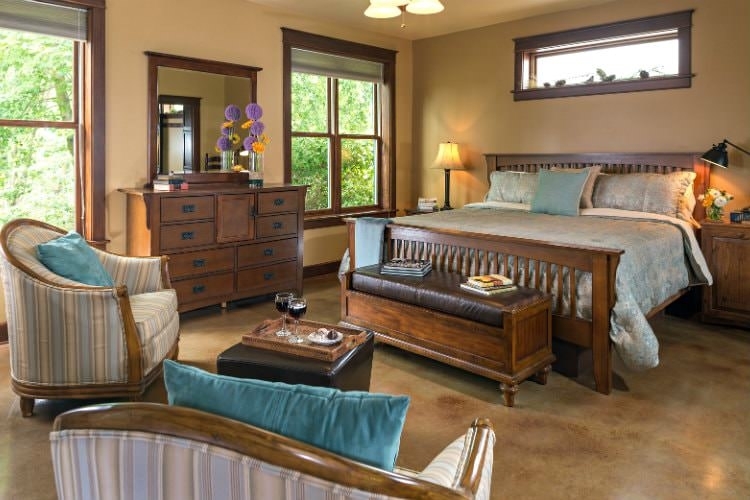 Each room has Wi-Fi service, hair dryer, alarm clock, and common OTC remedies. Included in all guest bedrooms are ambient noise machines for those who find it too quiet or are distracted by the day-to-day noises associated with shared space. All rooms are unique, so guests should carefully peruse each room description to ensure getting the features desired. Rates subject to state and local taxes. Minimum two-night stay on weekends and holidays. 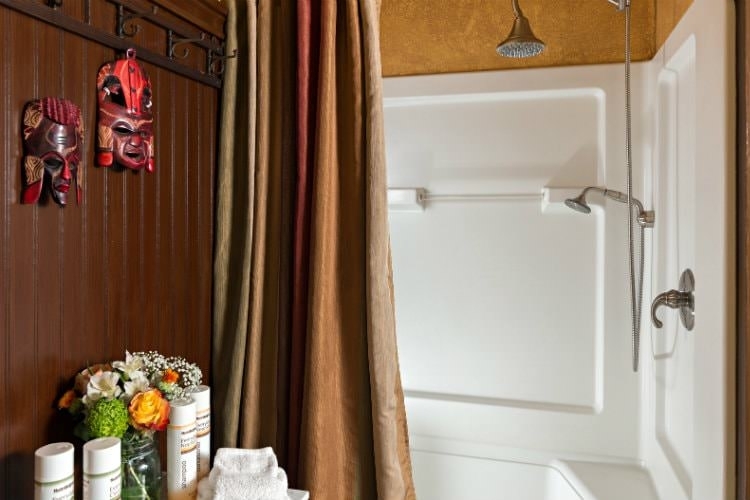 The Traveler’s Room is located on the second floor of the historic west wing and has a small, private en-suite bath with a shower. The unique vanity is made from an antique ladies’ dressing table and has a glass vessel sink. The comfortable, queen-size, four-poster bed is made up with fine linens to pamper your senses and lead to a restorative night’s sleep. 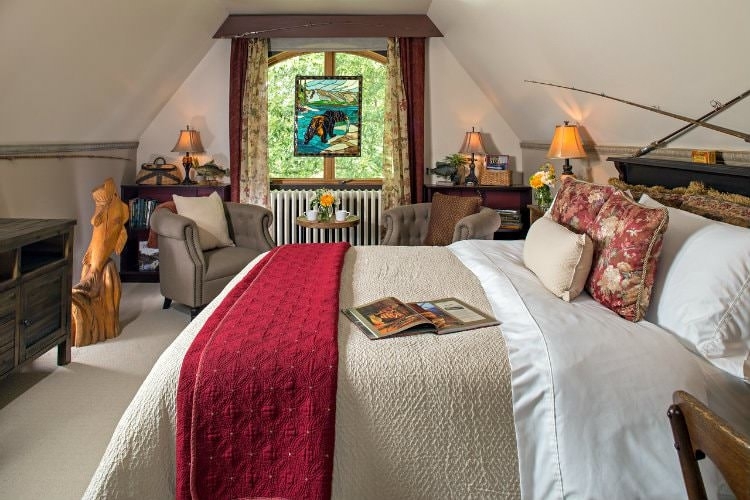 This restful room houses a mix of antique and modern original art, and is outfitted with organic bath essentials, a basket of munchies, comfy robes and plush, 100% cotton towels. 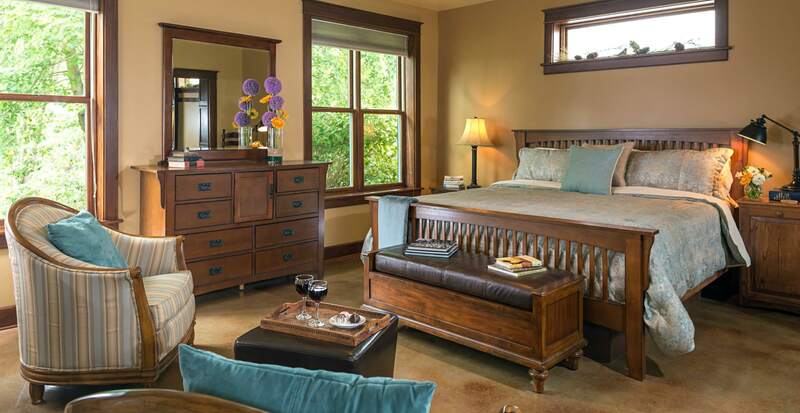 This room is comfortably climate controlled by central air conditioning and hot water radiator. The Teacher’s Room is located on the second floor of the historic west wing, and shares the spacious, hall bath with the Trapper’s Room. The detached, shared bath is outfitted with organic bath essentials and plush, 100% cotton towels. 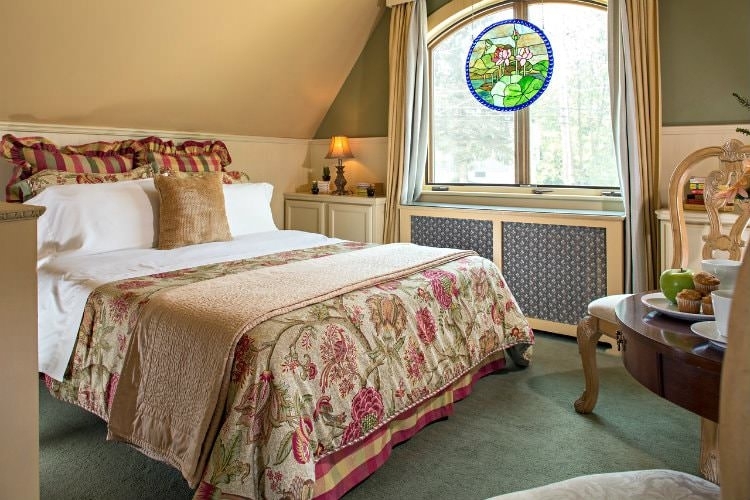 There is a pedestal sink tucked conveniently in one corner of this beautiful room, and you will find the room stocked with personal amenities, a hair dryer, a basket of munchies on the dressing table, and robes in the closet. 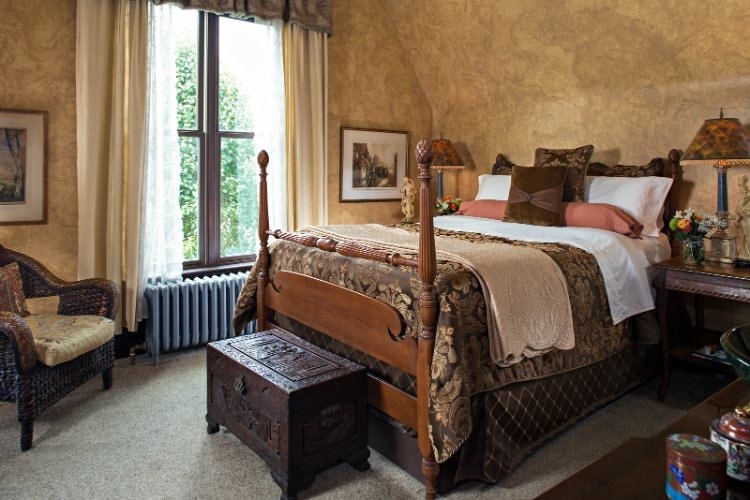 The comfortable, queen-size bed has no footboard and is made up with fine linens to lead to a restorative night’s sleep. The walls are one-of-a -kind, hand-embellished creations, and glow under the light of the crystal chandelier. 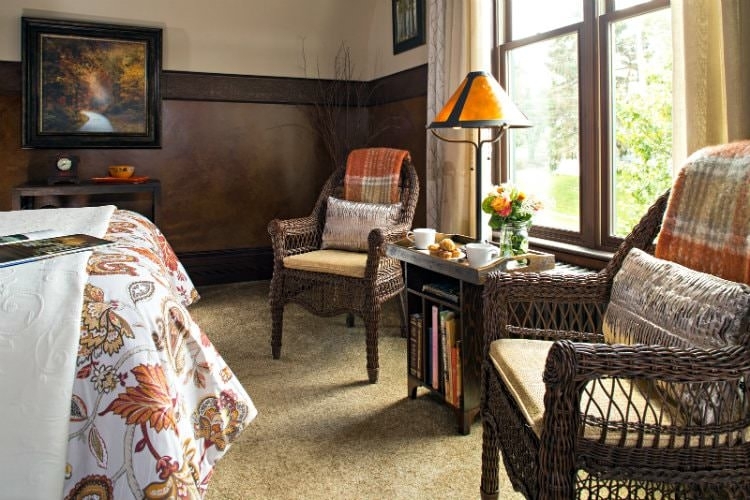 This room is comfortably climate controlled by central air conditioning and hot water radiator. The Trapper’s Room is located on the second floor of the historic west wing, and shares the spacious, hall bath with the Teacher’s Room. The detached, shared bath is outfitted with organic bath essentials and plush, 100% cotton towels. 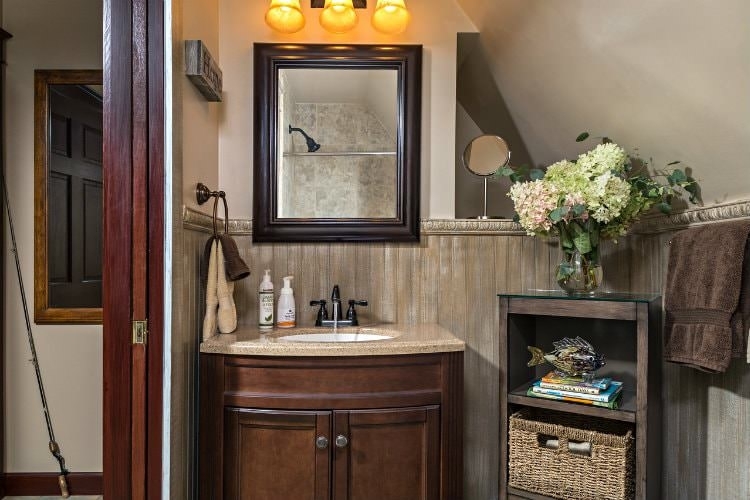 There is a vanity tucked conveniently in one corner of this outdoor-inspired room, and you will find the room stocked with personal amenities, a hair dryer, a basket of munchies, and plush robes. 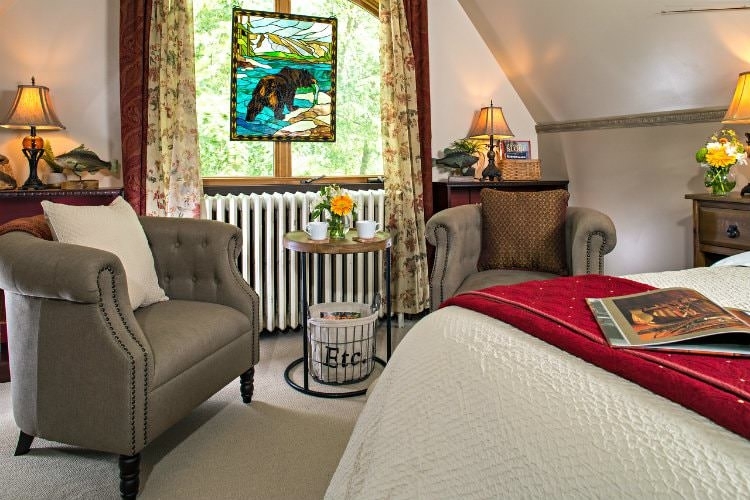 The Trapper’s Room has a southern exposure that looks over our quiet, historic National Road. It is elegantly masculine in decor, with outdoor-inspired artwork and comfortable seating for two. A small number of hides and taxidermy adorn the faux-finished, leather walls. 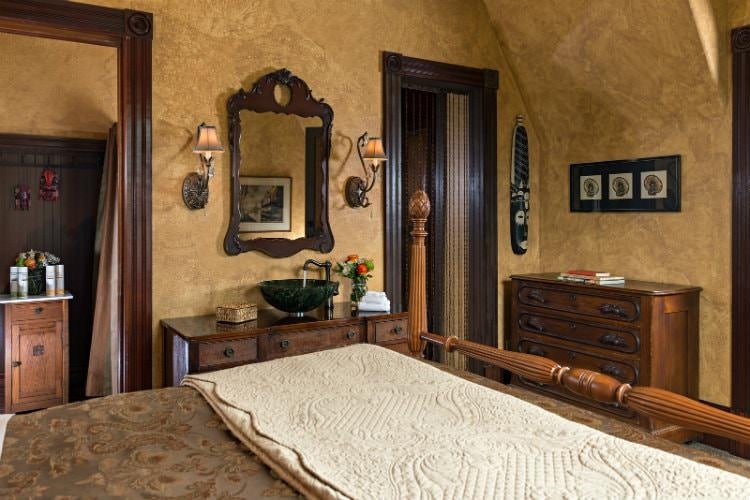 An extra-plush queen-size bed is crowned by a hand-carved, antique oak headboard. 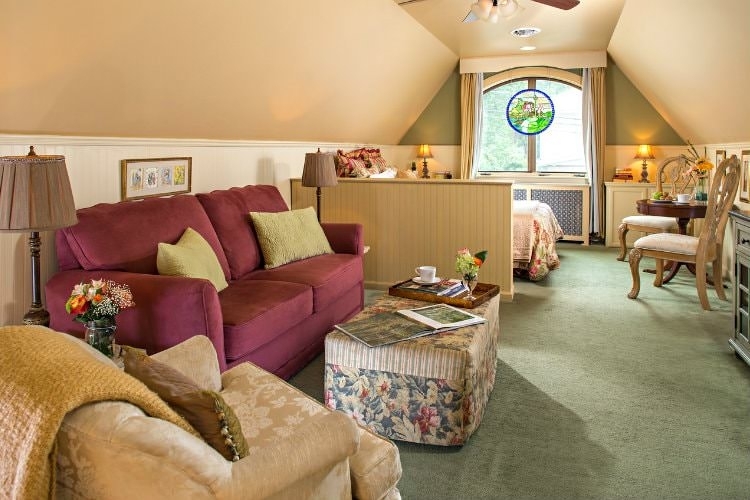 This room is comfortably climate controlled by central air conditioning and hot water radiator. The fully handicap-accessible Patriot’s Suite is a street-level room, accessed by the east wing, barrier-free front door and parking area. This large room is colored in restful hues of blue and gold and furnished with Mission-style oak pieces and two comfortable club chairs. 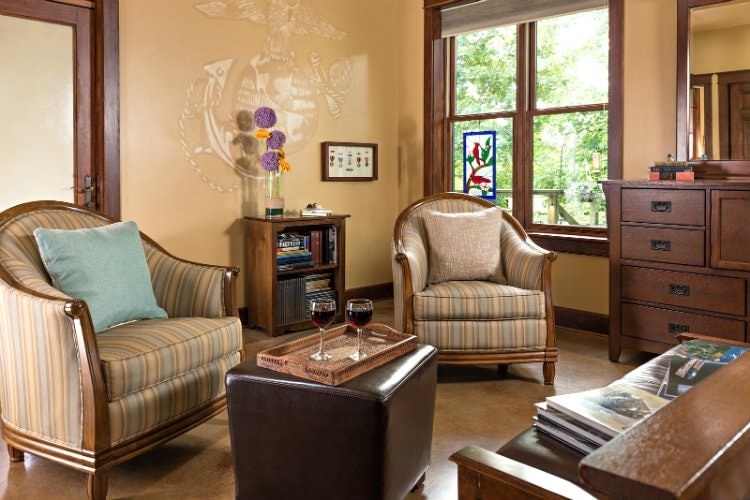 The sitting area is supplied with reading material designed to delight our Nation’s heroes (and those who appreciate them), and is easily adaptable to accommodate a wheelchair. 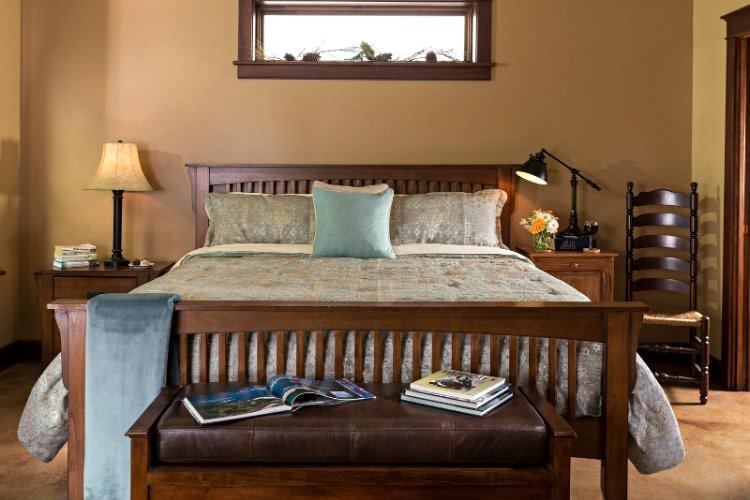 The bed is an elevated Memory Foam king (can accommodate your Hoyer lift), and made up in soft, high-quality bedding to ensure a good night’s sleep. 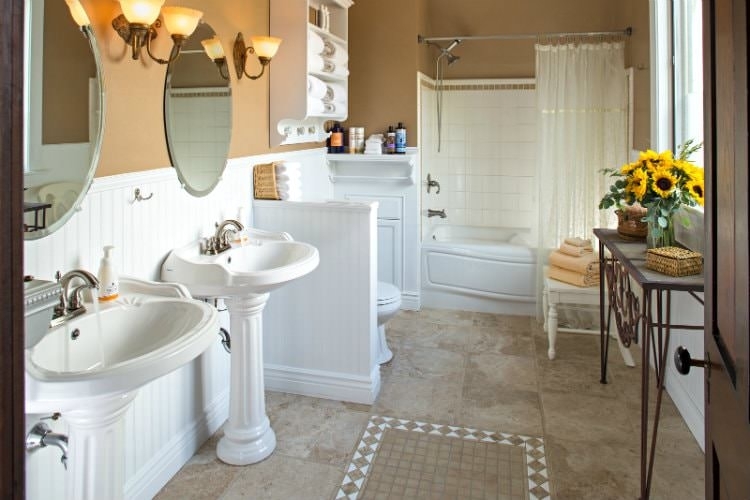 The ample, attached bath has a no-barrier shower big enough for a small army. 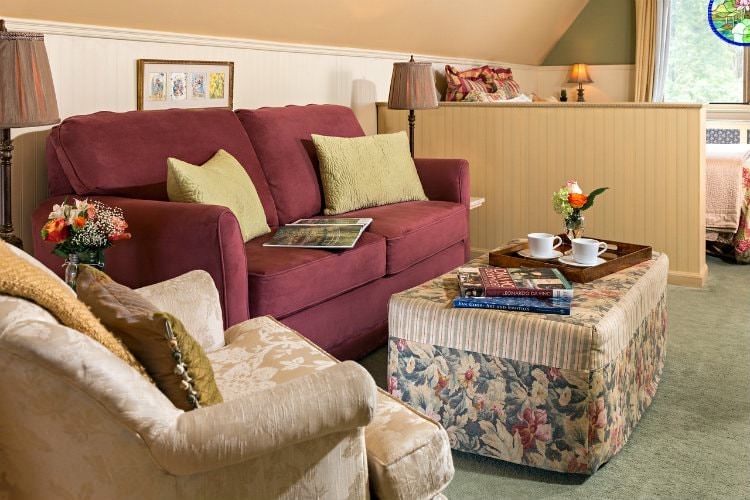 The Patriot’s Suite can accommodate up to three people with the addition of a twin aerobed. Please note: The main front door to Hartzell House Bed & Breakfast has three steps, but the east-wing entry is level with the street, and gives barrier-free access to the entire first floor of the inn. Please call us if you have mobility concerns, so we know when to expect you and may make arrangements to greet you at the correct door. 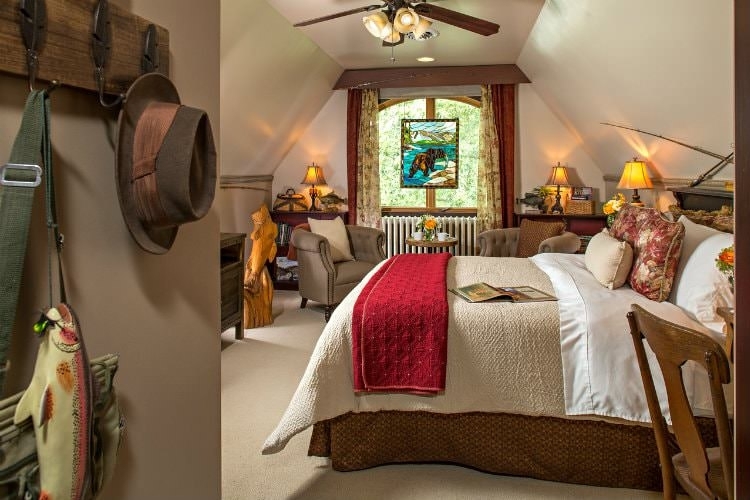 The upstairs Angler’s Suite overlooks our backyard and will inspire sweet dreams for the outdoorsman. 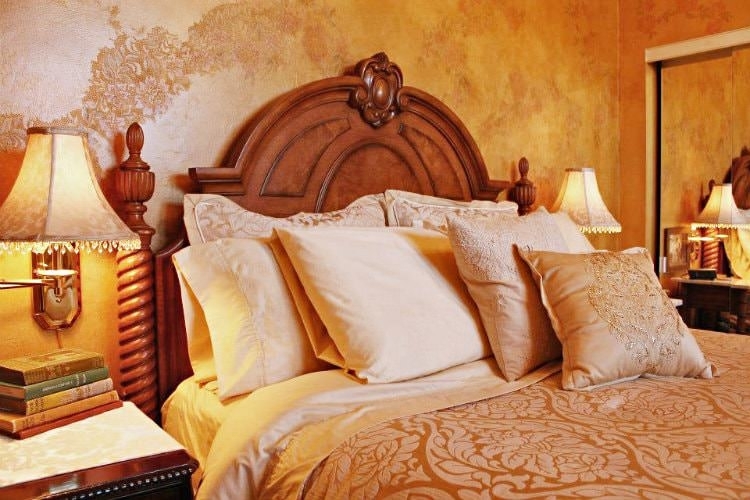 The bed is a plush queen Memory Foam mattress, dressed in fine linens to suit the season. The room houses a cozy seating area with two club chairs, built-in bookcases filled with camp-inspired reading, and vintage rods and reels. 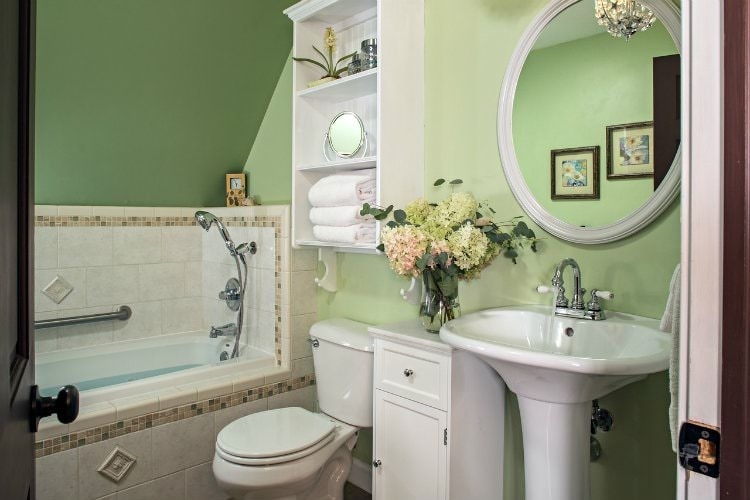 The beautiful little en-suite bath has a comfortably sized tiled shower and is outfitted with organic bath and body products, plush towels, and various sundries. This room has a new “Smarter-than-Me,” Wi-Fi-enabled TV, for the enjoyment of those guests who can figure them out. 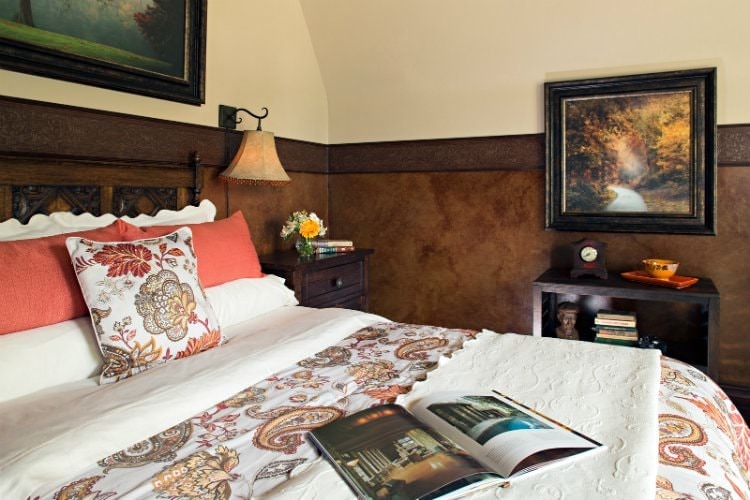 The Angler’s Suite has individually controlled heating and air conditioning. Please note: The stairs leading to this suite have tall 9” risers and are spacious, well lit, and have a sturdy handrail, but may not be optimal for guests with mobility concerns. The Artist’s Suite is on the second floor of the east wing and overlooks our quiet Main Street. 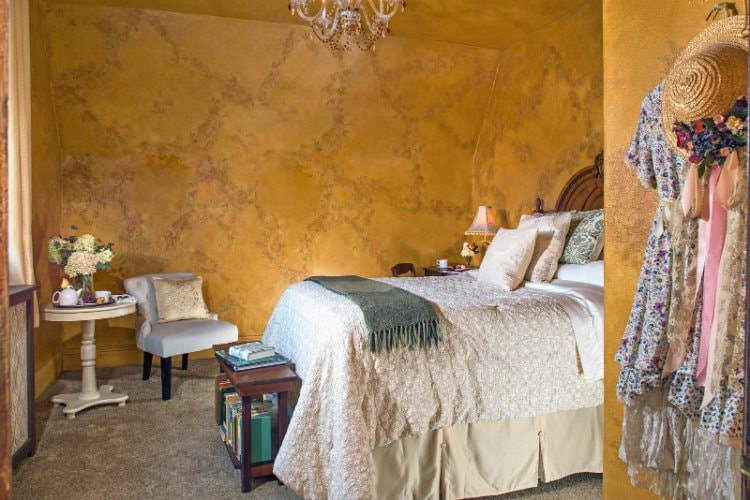 This suite has the flavor of a Paris studio, decorated in soft golds, yellows, and greens, with rose accents. The plush sitting area is comprised of a Lazyboy convertible sofa (opens to a very comfortable double bed), a club-chair, and a new “Smarter-than-Me,” Wi-Fi-enabled TV, for the enjoyment of those guests who can figure them out. The sleeping area is separated from the sitting area by a low bookcase and has a Memory Foam queen bed. The private bath, which is situated next to the suite, has a relaxing Jacuzzi tub and hand-held shower (no standing shower). 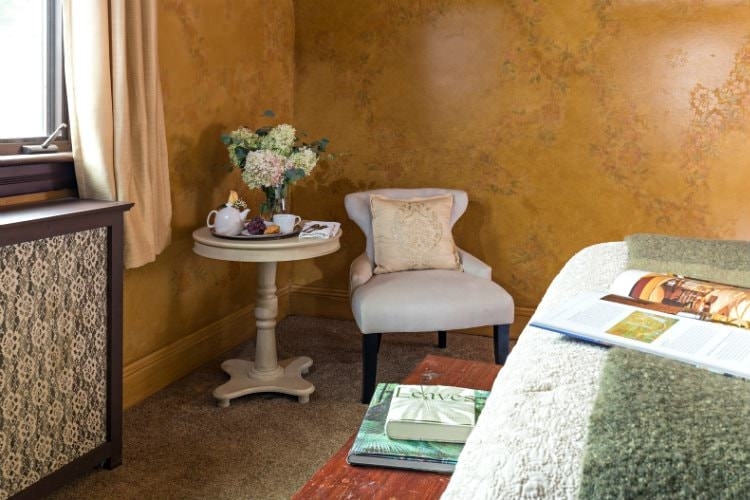 The Artist’s Suite has individually controlled heating and air conditioning. Please note: The stairs leading to this suite have tall, 9” risers and are spacious, well lit, and have a sturdy handrail, but may not be optimal for guests with mobility concerns. We LOVE the Southern Laurel Highlands and want to make sure that you have the opportunity to fall in love with this magical place as well. If we have no rooms available, please consider these other, well-vetted accommodations. Tell them that Hartzell House Bed & Breakfast referred you! Additionally, you can discover other great regional accommodations and activities by clicking Laurel Highlands Visitor’s Bureau. Please let us know if we may help you in any way! Fernwalk Cottage, an upscale, 2-bedroom, 2-bath, Craftsman-inspired home right next door to Hartzell House Bed & Breakfast. 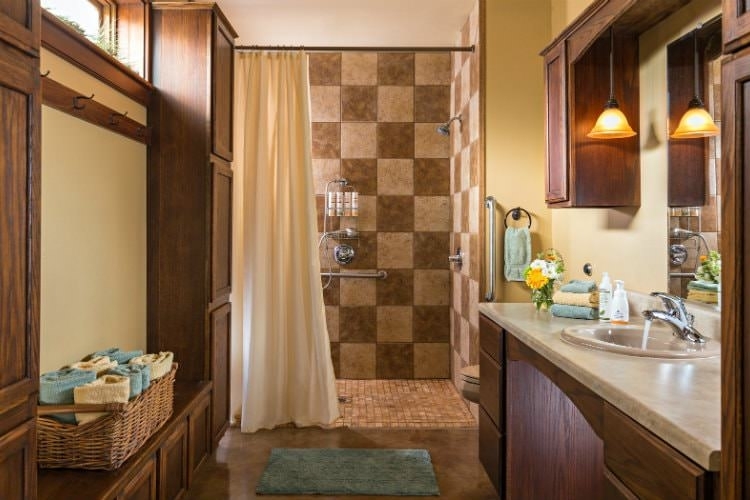 Fernwalk features a top-of-the-line gourmet kitchen, artisan stone gas fireplace, organic bath and body products, plush towels, robes, and fine linens, modern amenities, and locally produced Amish furniture. Hanna House Bed and Breakfast, a beautiful and historic B&B just off the GAP Hogback Road trailhead in Confluence, hosted by a gem of an innkeeper and our dear friend, Frances. Tell her hello from Kitty and David! Nemacolin Woodlands Resort a posh resort with every amenity imaginable, a world-class spa, and a restaurant collection that runs from a 1950’s-style ice cream parlor all the way up to the acclaimed 5-Star, 5-Diamond Lautrec. Or, spend the night with Frank Lloyd Wright at Polymath Park!